The Breakaway is a pattern formed during a bullish trend (uptrend) that indicates a start of sales. Sometimes the price moves into the oversold area. The figure opens with a long black day followed by another black day, with a candle having an opening gap. After the down gap, other three candles lead to lower prices. The Breakaway consists of black candles except for the third day that can be either black or white. The three days that follow the gap resemble the Three Black Crows pattern as their highs and lows form a descending sequence. The last day engulfs small black bodies of the preceding days completely. The Bearish Breakaway includes a gap in the direction of the trend. The gap is followed by three days and each next one has higher prices than the previous. 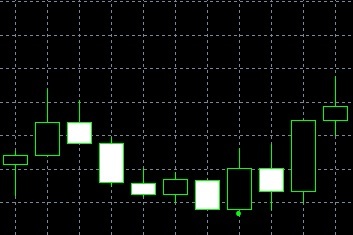 A long white candlestick is formed amid an uptrend. The next day an up gap takes place and another white body is formed. Then there are other two days of growth. These days are always white except for the third or second day after the gap as they can be either white or black. The key point is reaching a fresh high. Daily lows of the three days after the gap should be higher than the lows of the previous days. The price growth accelerates alongside the trend leading to the oversold condition. The last day points to a trend reversal when the closing prices are inside the price gap between the first and second days. It is important to remember that the trend accelerates after bullish gap formation and then slows down keeping its direction. Gradual weakening of the trend is typical for this pattern. A jump in the opposite direction explains price behavior in the last three days. A short-term trend reversal may unfold. The model is flexible while its basic preconditions persist. The gap may be followed by more than three days if the last day closes within the initial gap. However, the gap may be followed by only two days. The Bullish Breakaway can transform into the Hammer when the lower shadow of a reduced candle is two times longer than its body. This may happen if the gap of the second day is large and is accompanied by lower prices in the third and fourth days. 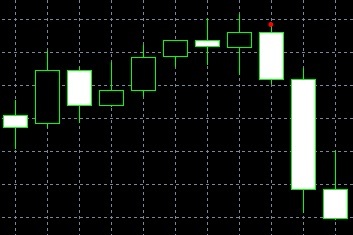 The Bearish Breakaway can become a long candle with a white body in the lower price range. This figure cannot develop into the Shooting Star because of a too large gap formed on the second day and consecutive price growth. There are no patterns similar to the Breakaway.